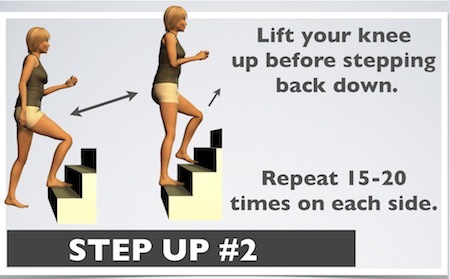 Knee strengthening exercises: Illustrated with 7 videos, challenging moves! This routine of knee strengthening exercises will challenge your thigh, hip and leg muscles to improve your strength and balance. Building the support for your knee joint in this way will also help improve your resistance to injury. As you’ll see below, each exercise can be adjusted to your ability level so you get the right intensity for your workout. Follow the illustrations, instructions and videos so your routine will be both challenging and safe! Starting position: Lie on your stomach and raise your upper body, knees and feet slightly off the floor as shown in the lower left illustration. Imagine reaching the top of your head and the soles of your feet away from each other as you do this. Hold your arms straight and squeeze your shoulder blades and your thighs together. Exercise movement: Hold the start position and bend and straighten your knees slowly, keeping your knees off the ground throughout the exercise. Also keep your knees as close together as possible--squeeze a pillow between your knees if that helps. Repeat 12-15 times. Add light ankle weights to increase the challenge. Begin with your R foot up on a 9” stair step. Raise up to stand fully upright, and then raise your L knee up toward your chest, driving your R arm up at the same time. Lower slowly in 2-3 seconds to return to the starting position. As you go down, touch your R toes to the ground, but try not to put all of your weight in your foot before you start back up. To increase the challenge, work from the second step, or use a higher platform (see video below). Repeat up to 15-20 times on each side. Are you not quite ready for these knee strengthening exercises? To build up to exercise #1, start with hamstring sets, standing leg curls, and "the Dart". To prepare for exercises #2 and 4, practice the intro routine here, and also try exercise #6 below. You’ll be ready to work on the single leg bridge once you can hold a 2 leg bridge with good form for 20-30 seconds. If you find exercise #5 difficult, practice this routine to build your core strength. Step backward with your right foot and lower your weight toward the ground. Stop at the point where you can feel your muscles working. Hold for 10-15 seconds. Keep both of your feet pointing forward and keep your left knee centered over your ankle. Also do not let your knee go forward past your toes. Use a wall to help with balance if needed. Repeat 4-6 times each side. As with the other knee strengthening exercises, you can adjust this move to match your ability level. A larger, deeper step will make the exercise much more challenging if needed. If this exercise is too difficult, it's fine to skip this one and focus on the other exercises for now. Are knee problems slowing your progress? Get specialist advice on how to beat knee pain. Put your feet up on a stability ball as shown. With your arms on the floor to help you balance, lift your waist up to form a straight line from your shoulders to your knees. Hold this position and curl the ball underneath your legs. Don’t let your body sag toward the floor during the exercise. Straighten your legs all the way and repeat 8-12 times. If this exercise is difficult, start by balancing with straight legs, then do small curls and work your way up. Stand with your back against a wall and step your feet out from the wall about 18”. Then lower yourself down into a squat. As with the lunge, stop at the point where you can feel your muscles working. Keep both of your feet pointing forward and keep your knees centered over your ankles. Hold for 15-20 seconds and repeat 3-5 times. You can squeeze a volleyball or playground ball between your knees during the exercise to isolate the inner quads. 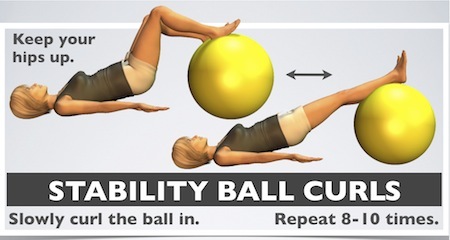 This exercise can also be done with a stability ball. Lean against the ball so that your waist is against the center of the ball. Of course, the deeper you go, the more challenging the exercise. Just don't go past a 90 degree angle so that you avoid excessive stress on your knee. The same goes for #4. 6 Knee strengthening exercises aren't quite enough for you? OK, here's your bonus move...For extra work on your hips, add "The Star" at the end of your routine. See the video below. This routine of knee strengthening exercises is versatile. Add it at the end of any physical activity, like after a brisk walk or an afternoon out working in your yard. You'll get a lower body strengthening boost. Once you can make it through the full routine, try 2 times through, or add it to another routine, like this back-core workout. Return from knee strengthening exercises to free home exercise programs.